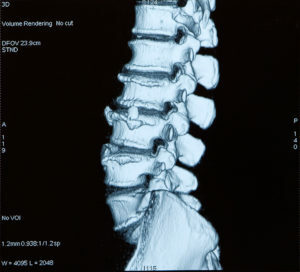 Disc degeneration in itself is not usually a problem; it is a normal aging process. However, DDD can cause the discs to lose height, resulting in nerve pathways narrowing and causing nerve impingement, inflammation, and pain. In severe cases, this neurogenic pain may be constant. 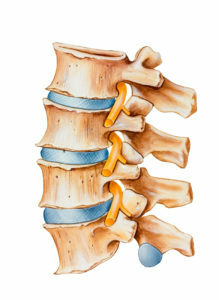 DDD may also cause mechanical pain, which results from the degeneration of the disc (the “shock absorber”) leading to bones in the spine pressing against each other. Diagnostic tests. Generally, we start with x-rays, which allow us to rule out other problems such as tumors and infections. An MRI will be taken to enable the physicians to assess the degree of disc degeneration, especially any loss of disc height. In some cases we also use a test called a discography to confirm the diagnosis. This test involves injecting contrast dye into the affected disc (or discs) to create a clearer image. For acute or sudden low back pain, we can prescribe pain relief medications such as acetaminophen, anti-inflammatory agents, and muscle relaxants. Temporary bed rest may also be suggested. But patients are encouraged to get up and gradually resume their activities. In addition to these treatments, the medical professionals at our practice have a deep commitment to patient education. By helping patients understand the causes of their conditions we can also help them to eliminate risk factors and to build “spine healthy habits” into their lives. While you are under our care, our medical staff will provide you with excellent information to help you recover, minimize risk factors and to stay healthy.